| step one | Begin by creating a pattern of size and color you want, I stuck to a similar color pattern, but I added two different colors not on the original design. Once you have established your pattern, start to glue pom poms to the shoe. Then let dry for 10 minutes. | step two | After glue has dried, cut off the front strap of the shoe (if you end up choosing a shoe that has already lace ups, then skip this step). | step three | Cut two sets of elastic bands at 2 inches long for each shoe (again, if you have lace up heels, skip this step). | step four | Use toothpick to place glue on the cut-off strap part of the shoe, once you have the glue on, place the elastic band over it (see picture below). Hold while it dries, about 2 minutes (trick: blow on it so it dries faster). | step five | Then cut off two sets of the real/faux suede cord at 24 inches long each. | step six | Use toothpick again to place glue on the tip of the cord that will go in between the elastic band. Hold while it dries, about 2 minutes, let it dry for another 5 minutes. | step seven | Once the the cord is securely glued, begin to sew around the elastic band and in the middle of the cord to secure it. This will actually be the longest process of the DIY, it took me about 15 minutes on each cord. | step eight | Once cords have been sewn, glue two 1 inch pom poms together between the end of each cord. This is your last and final step. 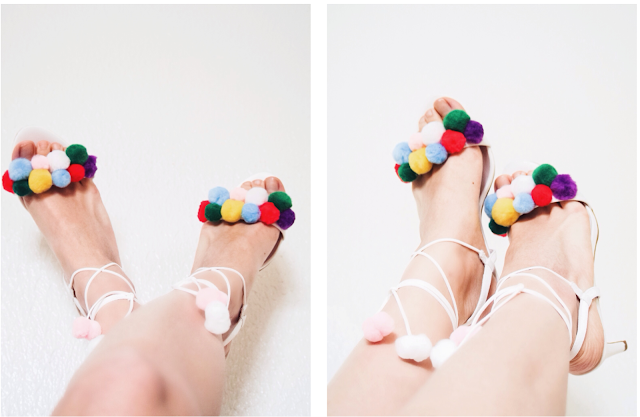 Today's fun DIY was a collaboration between my Miami blogger girl Gissi of The Architect of Style and myself, she had posted a snapchat video of a DIY that she had been wanting to do and funny enough I had thought of doing the same DIY, so we decided to team up to create our own inspired versions of the very famous Aquazzura Pom Pom Sandals that all the fashion girls love. She and I both love the Aquazzura ones, but the price point is not so friendly on my wallet at least, so what is a girl to do? create your own at around $50 for the whole thing, not so bad, not so bad. I chose to do a kitten heel, only because living in cobblestone street Germany is hard on a sista, so I gotta keep it low so I can get more wear on them. This DIY is for all my girls on a budget, because I look out for you! Hope you liked the way the sandals came out and go check out Gissi's version HERE, because you don't want to miss her's. Let us know what you think, we put a lot of effort to create fun content, so a little love from our readers is always welcomed :). 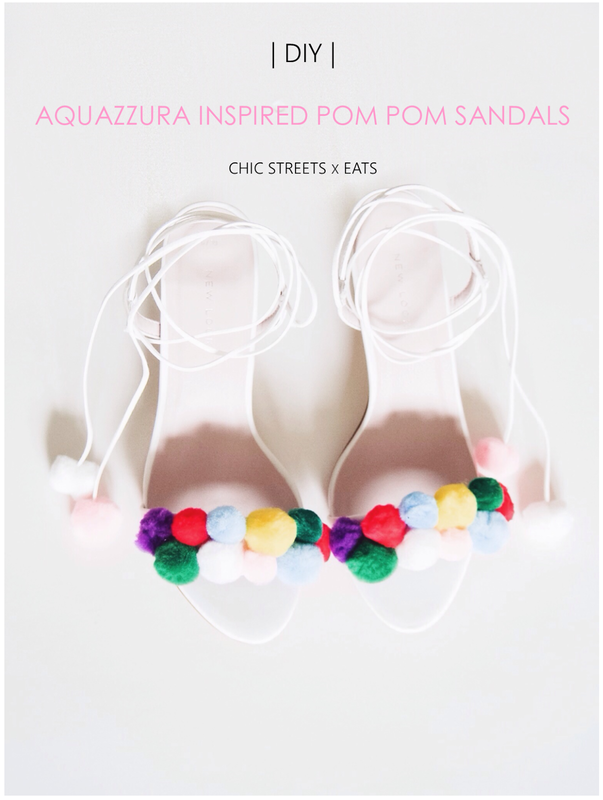 Guilty of buying the Aquazzuras but yours have more personality! Love this! They look fantastic!